Guelaguetza, the name of Mexico's main folklore festival, is an expression of the cultural richness of the different regions that make up the state. This celebration takes place annually during July, usually from the second week onwards. The Guelaguetza is an annual festival usually held in the last weeks of July. This traditional fiesta is in appreciation of the harvest, and includes a variety of arts, culinary exhibitions, folk dances, and other regional performances. The Guelaguetza festivities begin with the election of the Centeotl goddess. A young lady will be chosen to represent the indigenous god of corn, and she will preside over all the celebrations. During the following weekends, people from the state’s different regions hold parades, showing off their typical costumes. Along with these celebrations, you’ll find dance, music and folkloric shows, and also samples of cuisine and traditional drinks from Oaxaca. The highlight of all the festival is the performance of the Guelaguetza itself, which involves a variety of folk dances from Oaxaca and other areas of the state. The show lasts for around three hours, with performances in the morning and afternoon on July 21 and 28. These festivities, also called "Lunes de Cerro", always attract thousands of visitors and locals. If you want to discover the richness of one of Mexico's greatest states, in terms of cultural events, and also get to know the city of Oaxaca and show your gratitude with the locals for the gifts you have been blessed with, then do not miss the festival of the Guelaguetza. Not only because of the extraordinary display of art and folklore, but also because of its deeper significance of solidarity, the Guelaguetza is a festival that will delight your senses, open your heart and enrich your spirit. 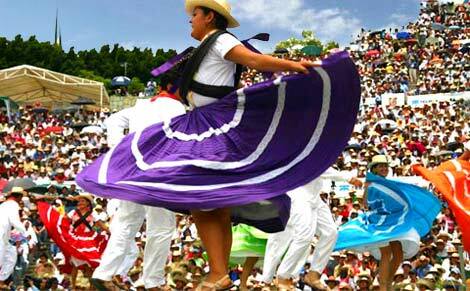 This July, visit Oaxaca and enjoy Guelaguetza!